Anyway, I decided to paint the pit crew from OK Motors – Giovanni, Beppe and Carlo. So this design was 100% inspired by the whole day I spent in Osaka, mainly Dotonburi, eating nothing but Takoyaki. (I am not even exaggerating, I literally only had Takoyaki and vending machine juice that day, well actually I also had an ice-cream filled melon bread but I don’t think that quite counted towards my 5-a-day.) A lot of the vendors had these super cute octopus mascots on their stalls to instill some guilt in you as you chowed down on their delicious bretheren. So for the whole time I was in Majorca, I was constantly searching for lizards! Apparently you should be able to see them just chilling or scurrying about and I love looking out for foreign wildlife. (I saw a hellish looking flying insect by the pool which turned out to be a not so scary ‘Mud Dauber‘) Therefore I was super disappointed when I saw not a single one, not even a flash of lizard tail or anything. The closest I got was purchasing a lizard magnet for my mum for a souvenir. So which came first – the chicken or the egg? I really fancied doing something hand painted today as I haven’t done so in a while. They were inspired by this cute little chicken shaped stapler I have on my desk. None of the office supplies are sensible, so I’m glad I don’t actually work in an office; my tape dispenser is a dachshund, my highlighters are snails and I have dinosaur pens. Author WonderfulWolfPosted on May 12, 2017 Categories WonderfulWolf Nail ArtTags Animal Nail Art, Animal Nails, Chicken Nail Art, Egg Nail Art, Fun Nail Art, Nail Art, Nail Design, Nails1 Comment on Which came first? So I’m starting off this week with a review about this Panda Stamping Plate from BornPrettyStore. It’s a large rectangle one, covered in cute panda images – 23 to be exact! (That works out to be 13p an image at it’s current sale price, pretty good value no?) It arrives in a cardboard pocket, and is of course covered with the blue protective film that must be removed before using. The images lend themselves perfectly to ‘reverse stamping’ or creating ‘stamping decals’ and that’s the technique I decided to go with. I started out with one of the detailed patterns as they have small lines that are tricky to pick up perfectly. As you can see, the pandas picked up pretty well! The only one that’s a little touch and go is the central panda but once on the nail it’s barely noticeable. I removed the black hearts, deciding to paint them free-hand later and painted in the panda heads white. I then stamped this on to my nails. The second image I chose was the panda holding the ‘I love you’ sign, I mean it’s so appropriate for this time of year but so darn cute any other time too! I had a little more difficulty picking up the ‘I love you’ part, again I’m putting this down to the very fine lines however it’s easily corrected by painting the missing parts in if you’re wanting it perfect. The plate certainly lives up to it’s name as the results are pretty darn cute! One problem with directly stamping the ‘I love you’ note on to your nail is that it’ll be back to front, I learned that the hard way, so I had to create that as a decal and place it on my nail the right way around. The second design I chose to do with the plate involved using one of the images with larger spaces, to test out how well they scraped – would they be patchy? No, definitely not! I’m going to say it again, but how cute! The plate is certainly worth the money, there’s a lot of fun and versatile images. It’s actually a perfect ‘scrape and go’ plate, apply a white base and stamp away – instant pandas! 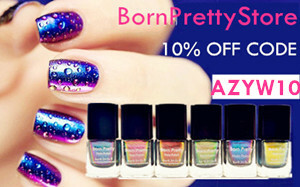 If you order anything through BornPrettyStore, be sure to use my code ‘AZYW10’ to receive 10% all full priced items when you check-out. So today I’m reviewing a pot of ‘Fuzzy Flocking Powder‘ sent to me by BornPrettyStore. It comes in a little screw-cap tub within a plastic pocket which helps keep all the fibers that might escape away from everything else. When I saw the colour of the powder, which is option #4, I immediately knew what it was destined for – anyone else see that colour as bear? I firstly outline the desired shape in brown polish, but it wasn’t enough for this bear to be fuzzy, he had to have dimension too! So I painted up a few layers of UV cured gel to create a 3D head shape. He’s still not finished though, he was missing his eyes and nose of course. Again I used cured UV gel to give them dimension and ta-da! As you can see, the flocking powder has done a really good job at covering the whole area and retaining it’s own colour – you’d bearly (haha) know that there was such a dark brown underneath. If you’re not keen on using the flocking powder in such an extravagant (ridiculous) way and are looking for a quick and easy design, then I suggest you try the fuzzy leopard look! I used normal polish for this and even though the coverage isn’t as good, the fuzz is definitely noticeable. Have you tried flocking powder before, if so what do you think of it? Do you prefer the bear or the leopard print design? If you place an order with BornPrettyStore, use the code ‘AZYW10’ at the checkout to receive 10% off all full priced items in your basket! Yaaay! Author WonderfulWolfPosted on January 25, 2017 January 25, 2017 Categories BornPrettyStore, WonderfulWolf Nail ArtTags Animal Nail Art, Animal Nails, Bear Nail Art, Born Pretty Store, Born Pretty Store Flocking Powder, Cute Nail Art, Flocked Nails, Flocking Nails, Flocking Powder, Leopard print, Leopard Print Nail Art, Nail Art, Nail Design, Nails, Product Review, Velvet Nails8 Comments on BornPrettyStore: Fuzzy Flocking Powder..